At the beginning of August we got a notification on our Local Giving page telling us that somebody had started fundraising for us. What an awesome surprise, we thought and clicked on over to take a look. Now there are some crazy cake people out there (us included! ), but this was a stranger, a cake-loving-stranger to be precise, with absolutely zero connection to Free Cakes for Kids Hackney, who had decided to raise money for us by giving up cake for the whole of the month of August. Bonkers, right? Did she cave? No she did not! 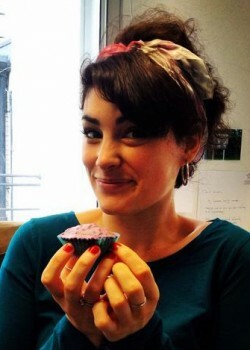 For THIRTY ONE days not even a crumb of scone or lick of buttercream passed the lovely Lou‘s lips. What happened instead was that she raised ONE HUNDRED AND FIFTY beautiful British pounds for us. Woot. <<< And behold her face when she got to eat her first cake after #nocakeaugust! 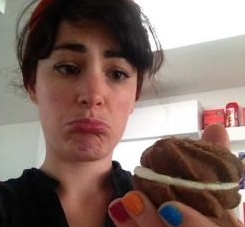 What a difference to the sad face above that could only look upon a whoopie pie. Torture! Thank you, thank you, thank you, Lou. You are definitely bonkers but we totally appreciate the support. And we are in no way making light of the fact that most of the children we work with do not have cake in their lives, not even on their birthday, let alone any random day in August. This little fundraising project only highlights how sad that is. Imagine your life without cake. No thanks. Right, now let’s put that £150 towards making sure that more and more children in Hackney get cake in their lives. We’re on a mission: join us. « Stars of the blogosphere; that’s us!